Mornings just aren’t the same. Late sleepers, once troubled only by the quiet gurgle of the boiling kettle, are now shaken from their slumber by the guttural sounds of steaming water being forced through aluminium or plastic coffee pods. Written by John Rice and Nigel Martin. Conveniently secreted into the coffee machine's collecting receptacle, the pangs of guilt from the latte socialists (and others) are only tweaked when the dank pods require emptying – generally well after the coffee has been consumed. Australia is in love with coffee pods. Wooed by no less than Hollywood star George Clooney, pods have taken Australian homes and workplaces by storm. As is the case for other beverages, Australians have shifted to drinking better quality coffee and pods are part of that mix. While pods are one of the the most expensive ways to buy packaged coffee, they are also one of the most convenient. The Swiss coffee pod innovators at Nespresso (a division of the food behemoth Nestlé) have been joined by usurpers including Germany's Aldi and Italy's Cafitally. 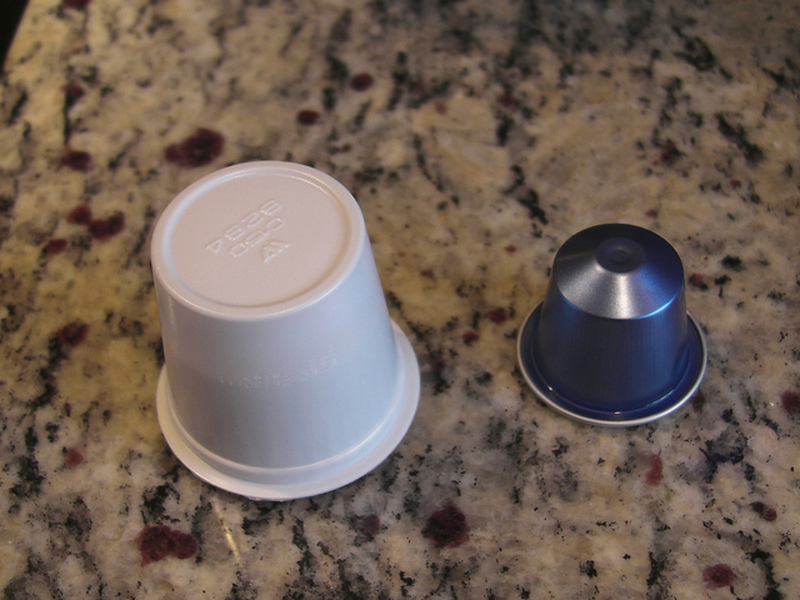 Proving that patents are easier to take out than protect, Nespresso's share of the world pod market has been in steep decline. This having been said, the industry is in a rapid phase of growth – sales are soaring – and thus few are complaining. Yet the news is far from all good. Pods are emblematic of a wider problem in our society, where we often say one thing and generally do another. In this case, where many of us like to speak about being "green" or living sustainably, even while sipping from a cup of coffee produced by an industry that is about as sustainable as an ageing Soviet nuclear power plant. If, as some predict, pod use doubles over the next five years, a veritable environmental tsunami is in store. While recyclable in theory, in practice pods rarely are, particularly the plastic variety beloved by the budget-conscious. Instead, they end in landfill: perhaps a poignant sign for garbage archaeologists a thousands years from now of this generation's environmental profligacy. Last year, independent consumer group Choice reported that Nespresso had sold an estimated 28 billion capsules worldwide – about 28 million kilograms of aluminium, much of which may be sitting in landfill, with recycling figures not made public. New Zealand's Ethical Coffee Company has created a vegetable-based biodegradable coffee capsule that is Nespresso-compatible and can be thrown straight into the compost. However, the shelf life of these pods is likely to be far more limited than the most commonly used aluminium or double-wrapped plastic pods. Environmental problems are not the only vices embodied in pods. The coffee industry has long been wracked by criticism that its sourcing practices, especially in the third world, are rapacious. The Swiss multinational Nestlé, which first dreamed up the pod phenomenon, is no stranger to such criticism. It runs its own "sustainability" accreditation program, which it proudly pronounces now exceeds 75% for beans sourced. However, cynics might see the self-accreditation program as essentially self-serving, delivering few benefits or value-adding opportunities to coffee-growing communities. Perhaps most prosaically, critics often argue that pod coffee just isn't any good. A decent barista generally uses between 10 and 20 grams of ground coffee in a serve, while pods contain barely 5 grams. The decision to make the pods so small was carefully chosen to maximise profits, not taste. As a result, the coffee produced generally fails blind taste tests – labelled watery, musty and underwhelming by Choice. Hardly the words that the marketers would like to hear. And yet, the march of the pods continues. The American satirist H.L. Mencken famously quipped that "no one in this world … has ever lost money by underestimating the intelligence of the great masses of the plain people". In today's world, you could add the word "laziness", or more charitably "love of convenience", to the list. Pods, in their own humble way, tell us much about the future intersection of environmentalism and consumerism. Western consumers are generally supportive of the environment – so long as they don't have to do anything about it. Multinationals everywhere are wise to this, of course, and have created a phenomenon known to cynical greenies and academics as "greenwashing". This entails wrapping a product in a veil of environmentally positive haze, regardless of how fundamentally egregious its environmental credentials are. It all paints a less than rosy picture for the future, in which more businesses help create, rather than solve, environmental problems. How this all plays out remains to be seen. One thing, however, is predictable. For innovators who can blend branding and convenience while ignoring all else, the future seems assured. Read this next: Can we have our coffee and drink it too? How do you take your coffee? Do you use coffee pods? We'd love your input in the comments section below.